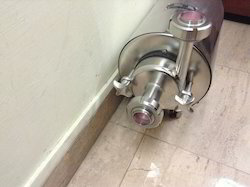 Our stainless steel centrifugal pump is centrifugal type coupled to electric motor / monobloc version. Having capacity 500 LPH to 100000 LPH, it has head up to 60 MWC in single stage. Along with it, we even offer multistage pumps on request. In addition to this, we even take up applications for transfer of liquids. We provide a complete range of stainless steel centrifugal pump - stainless steel beverage pump, stainless steel pump, ss dairy pump and ss pharmaceutical pump. 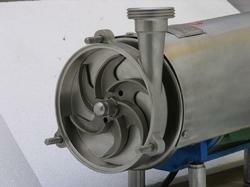 TAVRON Manufacture the SS Centrifugal Pump to the highest standard of Hygenic. The Pump will be made out of SS 304 / SS 316 and fitted with the Single or Double Mechanical Seal Assembly. The pump will be having the a legs with adjustable ball feet. The motor covered with the SS Shroud. · Can Work under Vacuum. We are engaged in offering SS Dairy Pump which are large in demand on account of their functionality, efficiency and accuracy. 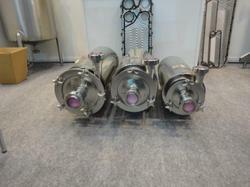 These are extensively used for pumping milk, cream, butter oil, evaporator plants etc. 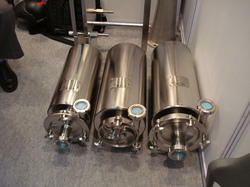 So as to efficiently pump formulations, our pharmaceutical pumps deliver long lasting service. Available at industry leading prices, these are simple in use, in maintenance and others.